Edmonton Workshops with Lucy Baker! ⏳⏰ Time is running out!! Space is limited, however, there are still a few spaces left!!! FREE presentation runs this coming Monday, then Tuesday and Wednesday will be jam-packed with techniques and hands-on healing and practice!! Share, tag friends that you think would be interested! This is a rare opportunity to work with one of Australia's most respected psycho-spiritual teachers, award-winning intuitive and spiritual advisor to women in leadership, TV celebrities and ordinary people intent on creating extraordinary lives. 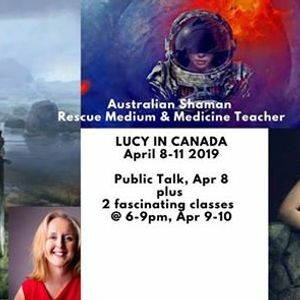 Lucy was initiated into rescue mediumship at 8 years old, has worked in crime cases, was recognised as shaman two decades later and spends much of her time showing women how to increase their power energetically. 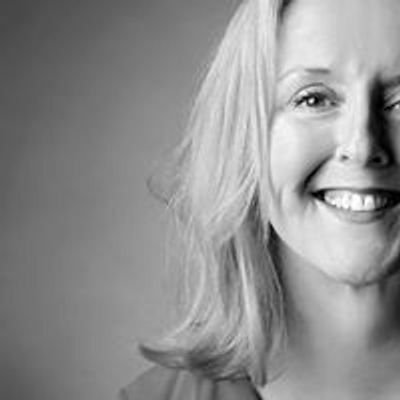 She is the founder of Australia's largest spirituality church, now a decade old, that uses ancient wisdom and contemporary healing to help humans find their peace, and the founder of The Lucy Daily, the popular free mojo-raising daily post that goes out to women across the planet via Facebook and Instagram. Lucy is in Edmonton briefly en route from her workshop in Iceland heading to her workshop in Texas, before returning back to her beloved Cockatoo Dreaming in the heart chakra of Australia. UPDATED ticket options to include flexibility of attending one night, two nights, or all three nights of workshop! Space is LIMITED, get your tickets before they're gone! ENTER NOW for your chance to WIN - EXTENDED to March 31, 2019!!! These workshops are suited to persons with any level of experience with an interest, anyone can benefit from these workshops. We have updated this event with the flexibility of attending all three nights, or book into each session individually if it works best for your schedule! Monday April 8th: Evening # 1: FREE Bonus Talk: 'What Happens If We Die Abruptly? The Rescue Mediumship of a M**der Victim'. Lucy will share the startling tale of a recent M**der, discuss what it is like for some souls that pass tragically or suddenly, and how we can help them transition peacefully. 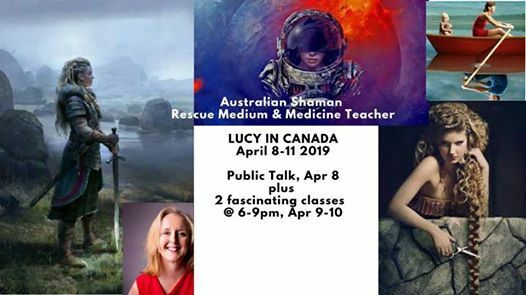 Tuesday April 9th: Evening # 2: Past Lives Mini-Workshop - from 6-9pm, Lucy will teach us how our past lives affect us, the different types of lives we have had and will guide us though some past life healing to help us in our lives today. Wednesday April 10th: Evening # 3: Clearing Your Home and Your Self From Bad Mojo runs from 6 – 9 pm - just as you would wash your car or clean your floors, you should be cleaning your energy field regularly. Lucy will equip us with the techniques we need to clean our energy and clear our personal space from energy that we may absorb from others. Entire Workshop Series: $180.00 (CAD), minimum of $90.00 (CAD) non-refundable deposit due upon registration. One Evening: $90.00 (CAD), minimum of $45.00 (CAD) non-refundable deposit due upon registration. **Please note that BONUS talk is FREE to attend, but seating is limited. Priority will be given to those that have purchased tickets to the workshop in advance. Special Mention: Lucy will be taking bookings for morning/afternoon private readings & regressions on Tuesday April 9th and Wednesday April 10th! Please reach out to Lucy directly https://www.facebook.com/messages/t/lucybakerpastor/ to set up a time that works for you! Book early to avoid disappointment! Every Woman Empowereds Spring Conference "Empowered Within"